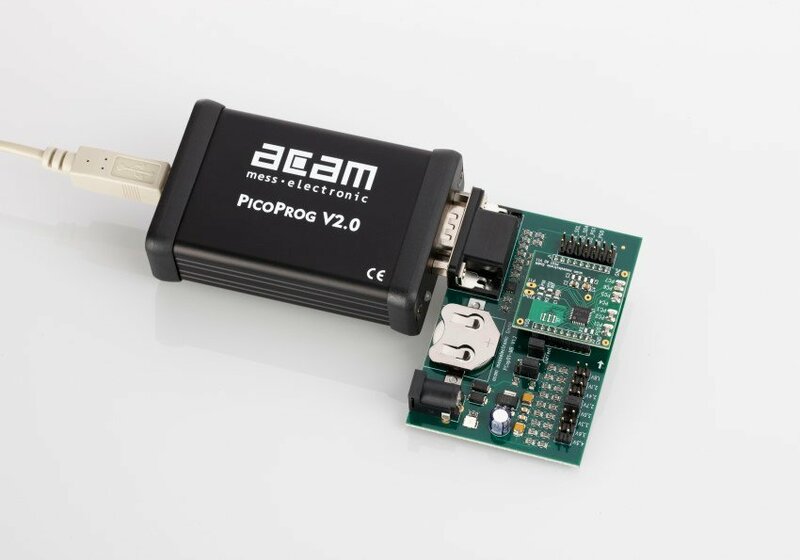 The chips from the PICOCAP® series are well suited for capacitive-based MEMS devices. 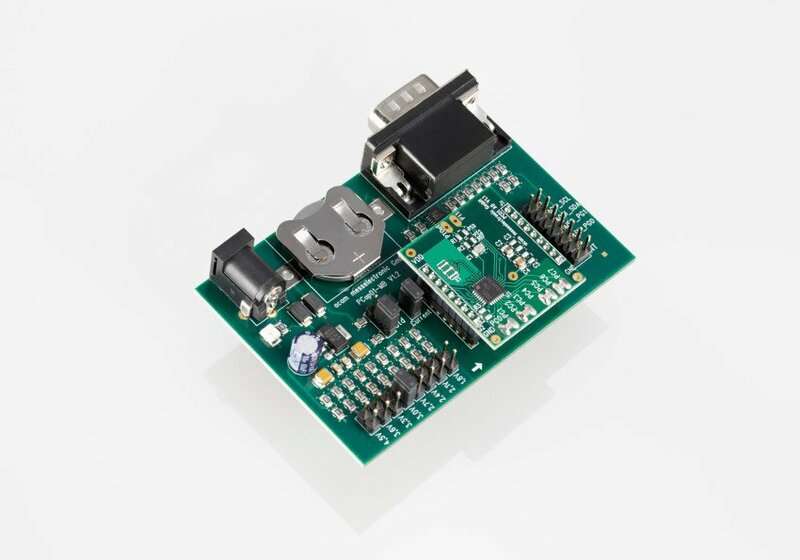 This is mainly because of the outstanding versatility the chips provide and the fact that they are programmable. The first refers to a great flexibility in regards of the capacitance range (a few pF up to hundreds of nF), the wide range of possible sensor connections and wide parameter set which provides a high level of adjustability (e.g. optimization of configuration for low-current, high update rate or high resolution). The programmability refers to the powerful internal 48-bit DSP with integrated memory space to accommodate user programs. 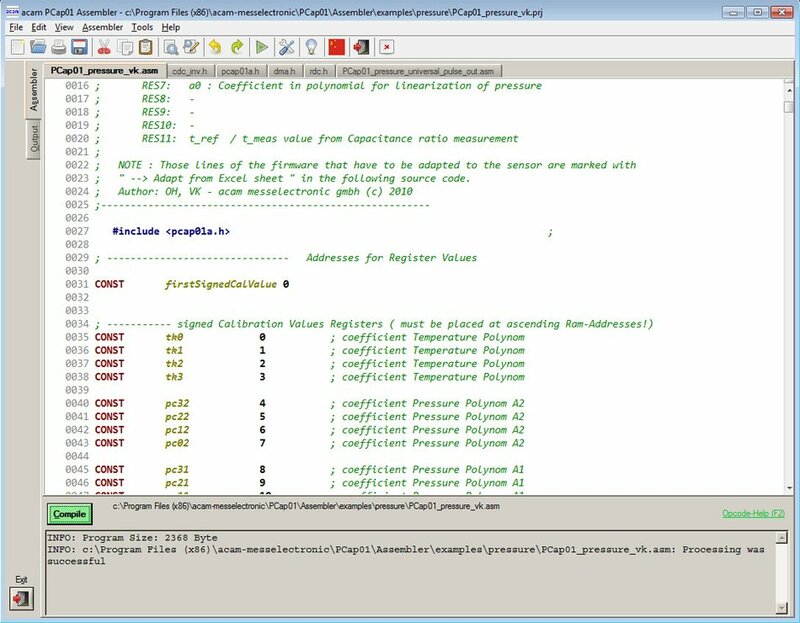 This allows for easy and convenient product adaption to your needs, examples of how to use the DSP are given below. 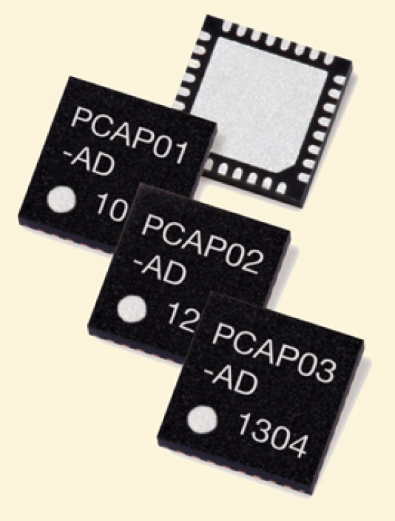 PCap01 has been the first chip of the PICOCAP ® product line and was introduced to the market in early 2010. Now, in late 2012 production samples of the successor PCap02 have been released (full mass production planned in Q2/2013) with a particular focus on humidity applications. 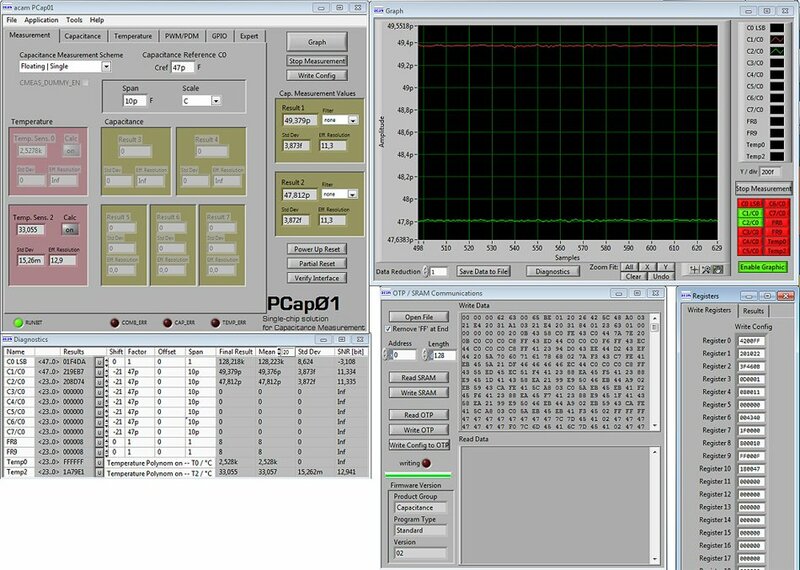 In early 2013 engineering samples of PCap03 for highest performance applications will be available. Capacitive pressure sensors in the range from 0.05 to 25 bar are widespread in industrial, automotive and consumer applications. The advantages lie in the high overload capability and the lower temperature sensitivity compared with piezoresistive pressure sensors. To increase the overall accuracy, linearization of the sensor is in the focus of many sensor manufacturers. Traditionally the linearization is done by means of an external circuitry, e.g. an operation amplifier combined with a resistor network and by using look-up tables. 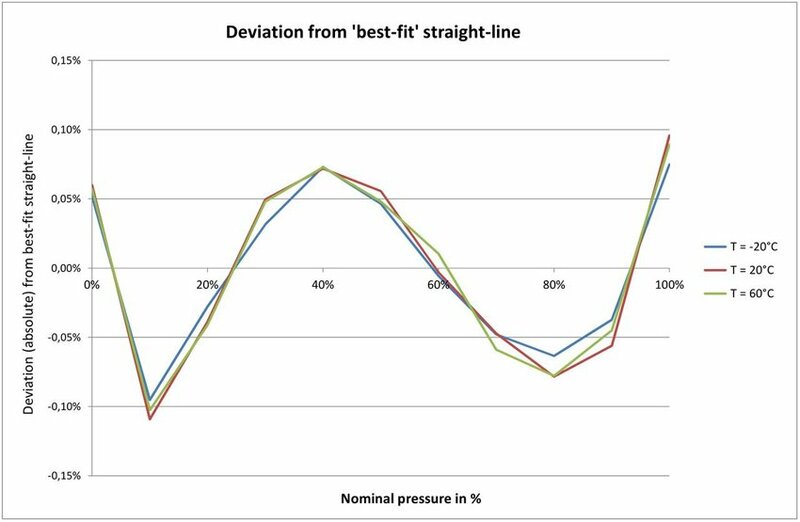 Today, calibration algorithms for linearization and also temperature compensation is becoming more and more common in ASICs; however often limited to given algorithms and a fixed set of calibration/temperature points. This is different with the PCap series. By using the fully-programmable DSP application specific firmware can be developed to meet the requirements of the particular sensor. More than that, the process can be fully automated. 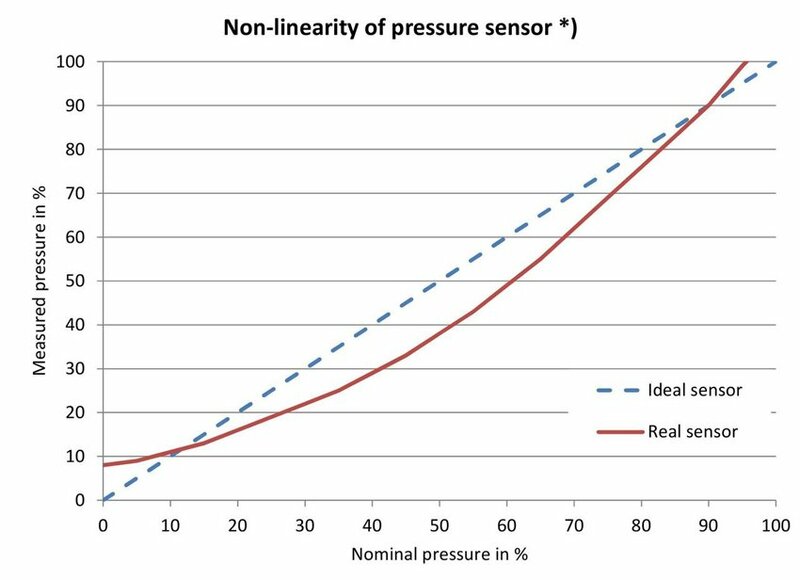 A non-linear function, such as the output of a pressure sensor can be described by mathematical equations, which approximate the characteristic of the curve. Thereby, the description of the non-linearity under consideration gets better the higher the order of the polynomial. The plot in the next figure illustrates the “best-fit” – curves ranging from a straight line to a 3rd order polynomial. 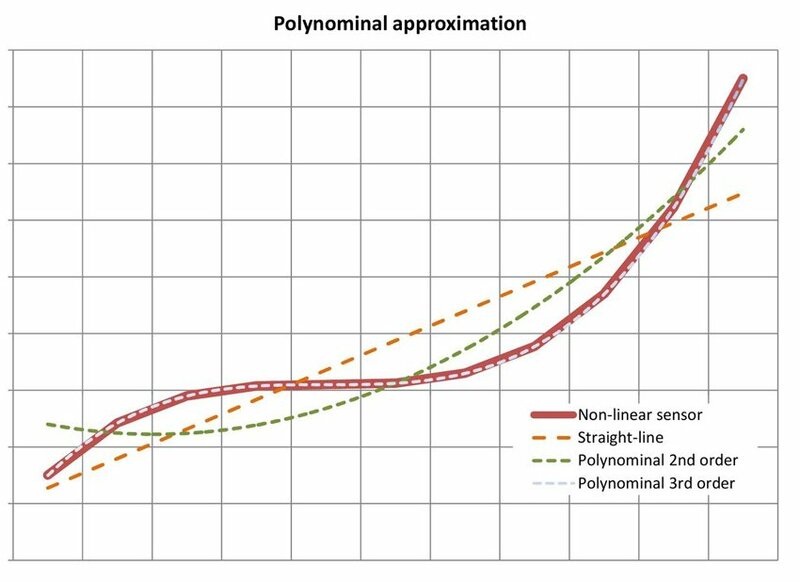 The bold red-curve is the assumed non-linearity of a sensor which is then first approximated by a straight-line (orange), 2nd order polynomial (green) and 3rd order polynomial (blue/gray). Obviously the approximation is the better the higher the order of the polynomial – especially if the non-linear curve bends several times and/or has a turning point. For the linearization with PCap01 a 3rd order polynomial was laid at the bottom of the DSP’s firmware. 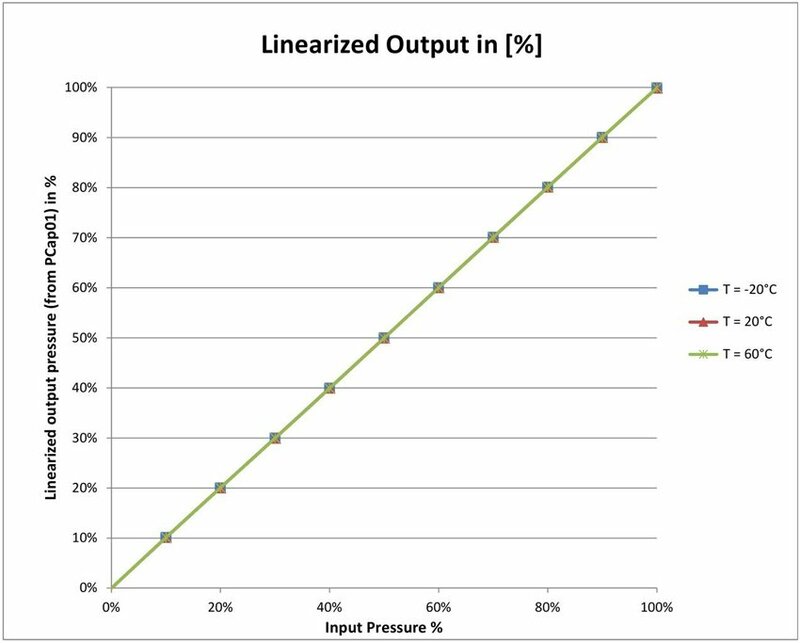 This means to have an optimal approach to do the sensor linearization. To get rid of the overlaid dependency on temperature, a 2nd order polynomial is furthermore implemented for each coefficient of the pressure linearization polynomial. The result of the pressure linearization (3rd order) with a sample sensor is displayed in the next figure along with the calculated error deviation.